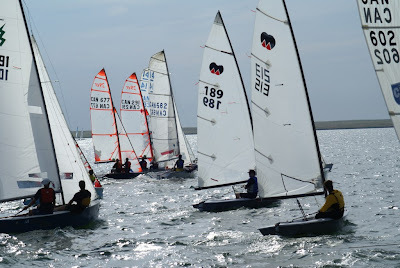 The Newell Sailing Club has for more than 33 years provided recreational and competitive sailing for southeastern Alberta sailors. We offer the opportunity for you to learn to sail without having to spend a lot of money and we help you get the experience needed to sail safely. When it comes time to buy your own boat, we help you with information that will make your decision easier. The Club facilities are some of the best in the entire province. 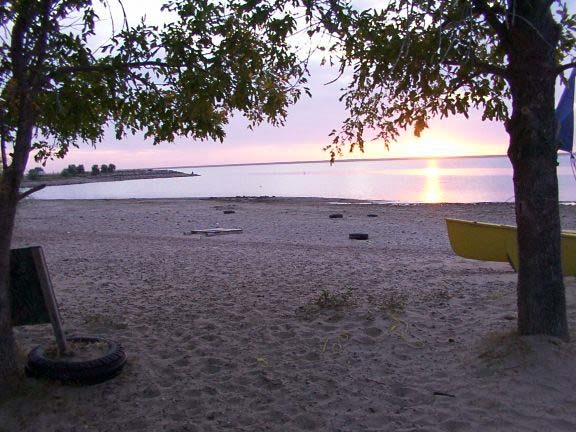 We sail on the best lake for sailing in Alberta with unobstructed shorelines that allow the wind to blow with little variation, wide open spaces with lots of room to sail, plenty of deep water and a good boat launch. Regatta/rescue/coach equipment 1990 or so. A photo of the low lake level, from years ago, when the lake would drop dramatically over the course of a hot summer. Water levels now vary only slightly over the entire year due to improvements by the irrigation district and additional storage lakes in the system. See www.eid.ca for more information about the Eastern Irrigation District. A photo of a fleet start at the 2007 Prairie Wind Regatta. The garage has had an addition added on since. The bathrooms and propane tank are long gone. Early boat parking area and unpaved parking area. The row of rocks below is now a convenient boat parking area for catamarans launched using dollies. Picture taken 1990 or so. The water rarely drops much below the vegetation line now, unless we have a very dry year. The picture below is near the launching area around 1990.